Missense mutations of the V600E type constitute the vast majority of tumor-associated somatic alterations in the v-RAF murine sarcoma viral oncogene homolog B1 (BRAF) gene. Initially described in melanoma, colon and papillary thyroid carcinoma, these alterations have also been observed in primary nervous system tumors albeit at a low frequency. 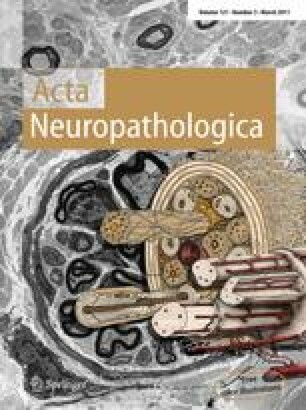 We analyzed exon 15 of BRAF spanning the V600 locus by direct sequencing in 1,320 adult and pediatric tumors of the nervous system including various types of glial, embryonal, neuronal and glioneuronal, meningeal, adenohypophyseal/sellar, and peripheral nervous system tumors. A total of 96 BRAF mutations were detected; 93 of the V600E type and 3 cases with a three base pair insertion between codons 599 and 600. The highest frequencies of BRAF V600E mutations were found in WHO grade II pleomorphic xanthoastrocytomas (42/64; 66%) and pleomorphic xanthoastrocytomas with anaplasia (15/23; 65%), as well as WHO grade I gangliogliomas (14/77; 18%), WHO grade III anaplastic gangliogliomas (3/6) and pilocytic astrocytomas (9/97; 9%). In pilocytic astrocytomas BRAF V600E mutation was strongly associated with extra-cerebellar location (p = 0.009) and was most frequent in diencephalic tumors (4/12; 33%). Glioblastomas and other gliomas were characterized by a low frequency or absence of mutations. No mutations were detected in non-glial tumors, including embryonal tumors, meningiomas, nerve sheath tumors and pituitary adenomas. The high mutation frequencies in pleomorphic xanthoastrocytomas, gangliogliomas and extra-cerebellar pilocytic astrocytomas implicate BRAF V600E mutation as a valuable diagnostic marker for these rare tumor entities. Future clinical trials should address whether BRAF V600E mutant brain tumor patients will benefit from BRAF V600E-directed targeted therapies. G. Schindler and D. Capper contributed equally to this work. We would like to thank Kerstin Lindenberg and Britta Friedensdorf for excellent technical assistance. We thank the tissuebank of the National Center of Tumor Diseases Heidelberg for supplying us with tumor material. This work was supported by the Bundesministerium für Bildung und Forschung (BMBF–01ES0730 and 01GS0883).